Maurice Harmon’s sixth collection moves from the sunlit terraces of faith to the dismemberment of a rural estate and that mingling of the metaphorical and the realistic characterises much of the poetry. The decline of Catholic power and the losses that went with it is a kind of underlying event that drives much of the poetry from the compelling dramatisation in ‘Hoops of Holiness’ to the human narrative of ‘Tales Out of School’, the libretto at the end of the book. It permeates the portrait of the priest who is having a passionate affair, a boy’s desperate flight from boarding school, and a woman’s determined efforts to keep a marriage going. Harmon responds with compassion and understanding to abusive priests, to the homeless and the hapless, and to disturbing events in his own life. He writes in a variety of forms, elegies, narratives, nature poems, villanelles, satires. His humane perspective enables him to write sensitively about individuals and to consider how we fail to understand and to interpret historical events, such as the sieges of Drogheda and Limerick. 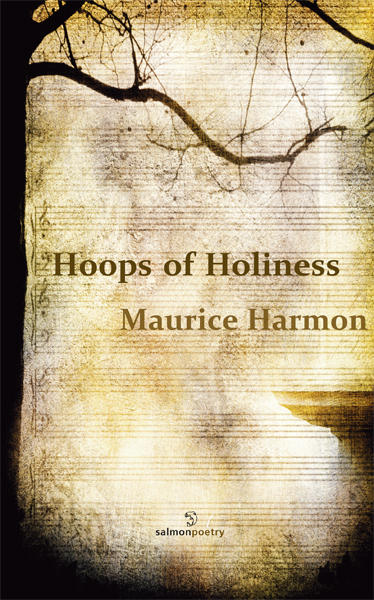 Hoops of Holiness is the product of a mature and intelligent imagination. Maurice Harmon, a distinguished academic, critic and scholar, has published studies of Irish writers from William Carleton to Mary Lavin, Seán O’Faoláin, and Benedict Kiely, from Austin Clarke to Thomas Kinsella, Seamus Heaney, and Dennis O’Driscoll. His pioneer anthology Irish Poetry after Yeats appeared in 1979 and his Dialogue of the Ancients of Ireland, a translation of Acallam na Senórach, the medieval Irish compendium of poems and stories, was published in 2009. Harmon’s reputation as poet has grown particularly with the publication of his acclaimed When Love Is Not Enough: New and Selected Poems (Salmon, 2010), followed by the stylish and humane Loose Collections (Salmon, 2012). Hoops of Holiness is his sixth collection.